Head over to St Michael’s Churchyard marquee for some eclectic and funky mixes. 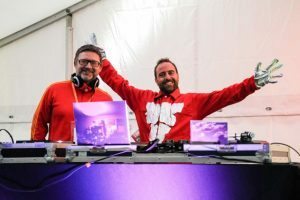 Expect Balearic beats and grooves; funk, soul, hip-hop, disco and house with sets from DJ CS Wallace and Plastic Fantastic DJs WaxSack, FunkRug and Dr. Scott. Barnaby Tap bar open through the afternoon and evening – beers from a range of local craft brewers, Forest Gins, wine and prosecco. Last orders 10.30pm.